We stay in a large forest, about 5 km from the nearest town and shop. The camp site is a youth camp with various buildings. All buildings are heated and have dormitories with common shower/toilet areas. The roads on the camp site are tarmac roads. Walking distance between the buildings is about max. 3 minutes. Bring forest clothes and it might be rainy and muddy when you go for a walk in the forest. For public transport useful links: trains and busses. Take train to Driebergen-Zeist (about 10 minutes). We ask many dancers arriving by car to stop by and give a lift to check if anybody is waiting. Other option is to take BUS 381. 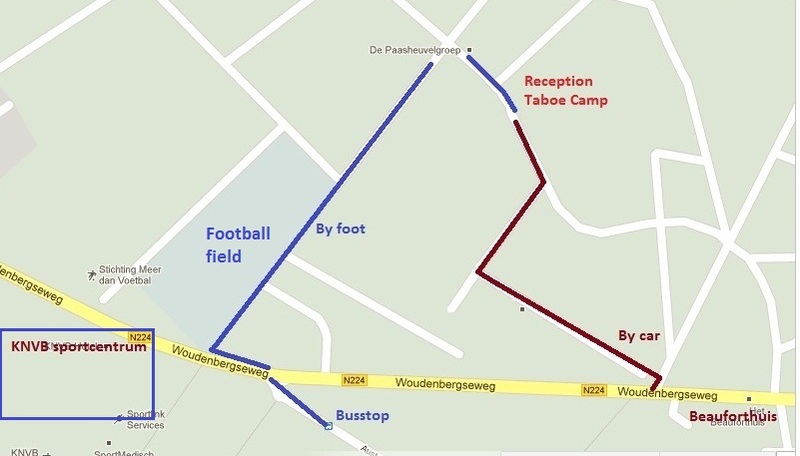 It goes once p. hour (14:26, 15:26; 16:26, 17:26 (last bus) from the station to bus stop "KNVB football fields" (just ask the driver). From there see map below how to walk. A last option is to wait for our shuttle car every full hour to the station at arrival day at 16:00, 17:00, 18:00, 19:00. 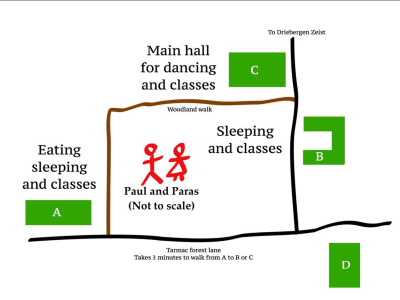 But call Paul at +31-61501690 if the party at the station is bigger than 4 people. So we can try to send more cars. In case you arrive after 19:00 call +31.6.150.164.90 and we send the shuttle car. Regiotaxi Utrecht, +31. (0)880.025.400, www.regiotaxiutrecht.nl (this is a collective taxi) last taxi before 24:00. Reserve at least one hour before. Taxi drivers sometimes can not find the location. Send them to the Beauforthuis, Woudenbergseweg 70. Go onto the forest road opposite the parking. Go left after 50 metre, go right after 300 metre following the Taboe Tango signs. Call Paul: +31. (0)15016490 and I might be able to send somebody, but no guarantee! Tell the bus driver you need to get out at the bus stop ’KNVB-sportcentrum". When you get out walk back to the main road, cross it and go left. After a few meters you will find a small path going into the forest (yes really). The path has a football field on the left hand. Follow the path (150 meters) to the macadam road, continue on the road and go first road to the left. You will see the reception after 100 - 150 meters. It is around 7-8 mins walk from the bus stop.